I went into my local DavidsTea because I saw photos of their new teaware products and just about fell head-over-heels in love with some of their new designs that are part of their Wellness Collection. 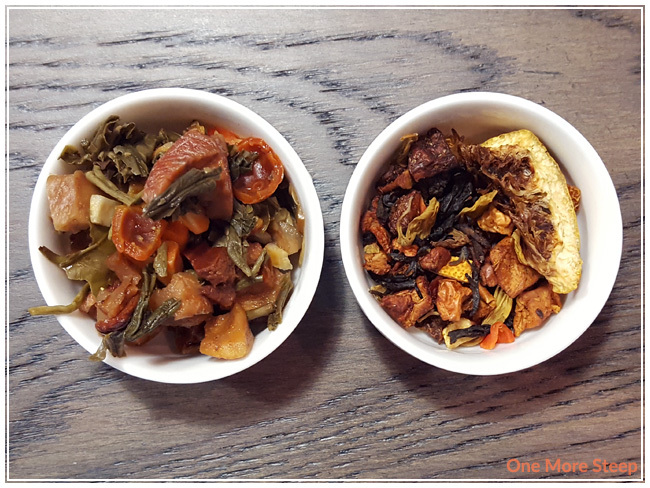 While I was there, I got to sample some teas (Blueberry Muffin and Lemon Cayenne Cleanse), and I wound up getting Lemon Cayenne Cleanse as part of my Frequent Steeper rewards. Lemon Cayenne Cleanse smells mostly of lemons to me, and I was a bit apprehensive about trying it at first after the salesperson told me that it contained peppers but she reassured me that it wasn’t spicy at all (and she was right!). 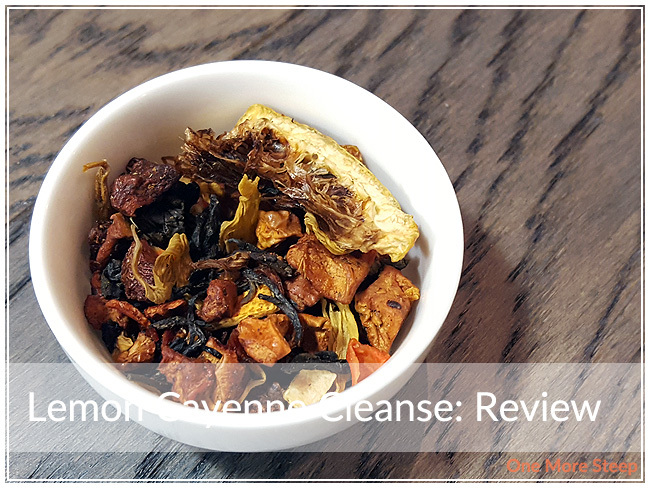 Lemon Cayenne Cleanse consists of: apple, white tea, lime pieces and peel, carrot, rose hip peel, lemon peel, chili peppers, sunflower blossoms, and natural lemon flavouring. The most obviously fragrance from the dry leaf is the lemon/citrus aromas, I can’t smell the chili peppers, apple, white tea base, or any floral aromas from the sunflower blossoms. 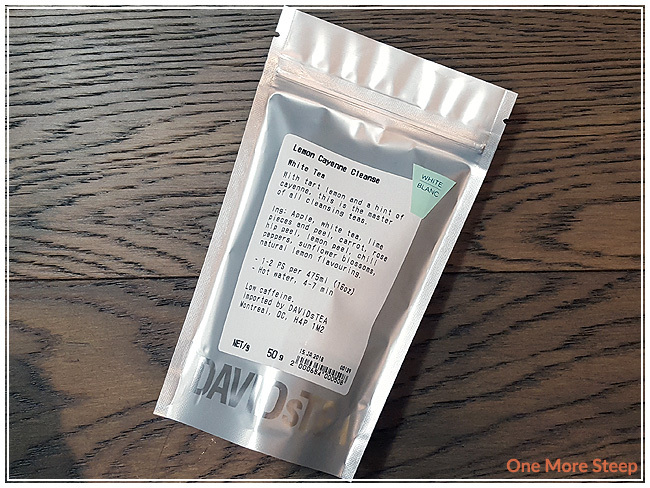 DavidsTea recommends steeping this white tea blend in hot water for 4 to 7 minutes on the packaging. For further details, I always go onto their website to the tea’s product page for more information. Hot water in this instance is 167-176°F (75-80°C). I opted to steep mine at 175°F, which is my Breville IQ Kettle‘s green tea setting (the white tea setting is 185°F), and I steeped Lemon Cayenne Cleanse for 3 minutes. Lemon Cayenne Cleanse steeps to a nice happy yellow. Despite using a stainless steel basket-style infuser (as part of my Tea for One set), I found lot of tea debris in my cup of tea. If that sort of thing bothers you, this is a tea I would recommend steeping in a tea filter bag instead. Ahem, back to the tea now. Lemon Cayenne Cleanse has a very strong lemon aroma to it. It tastes the same to me as when I sampled it in store – there’s a tart lemon flavour, with a touch of sweetness. There’s the warming properties of the pepper with each sip, but I don’t really get much of a spicy kick from this tea. I’m (generally) sensitive to heavy spices, and I usually shy away from things that are spicy, but I found this white tea blend not spicy at all. That said, I also don’t taste the white tea either. I resteeped Lemon Cayenne Cleanse twice. The first resteep, done at 4 minutes, the tea was an even brighter yellow, and I found the flavour to be fairly similar. The second resteep, steeped for 5 minutes, wasn’t particularly good. I found it to be watery and didn’t have the same warming properties as the first two steeps. I would say that Lemon Cayenne Cleanse is only good for one more steep. I liked DavidsTea’s Lemon Cayenne Cleanse. 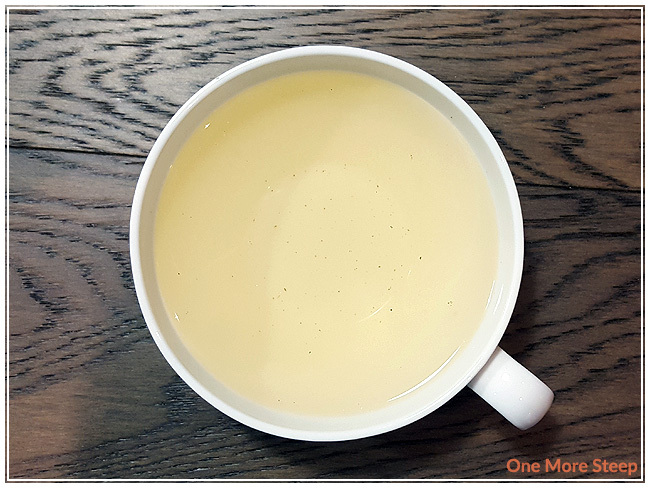 I really enjoyed the flavour of this white tea blend, I just wish the white tea shined through a bit more. The lemon flavour is really quite delicious, and I greatly enjoyed the warming properties of this tea. That said, I think it is a bit expensive for a tea that can only be reliably resteeped once, and it is quite a bulky tea. 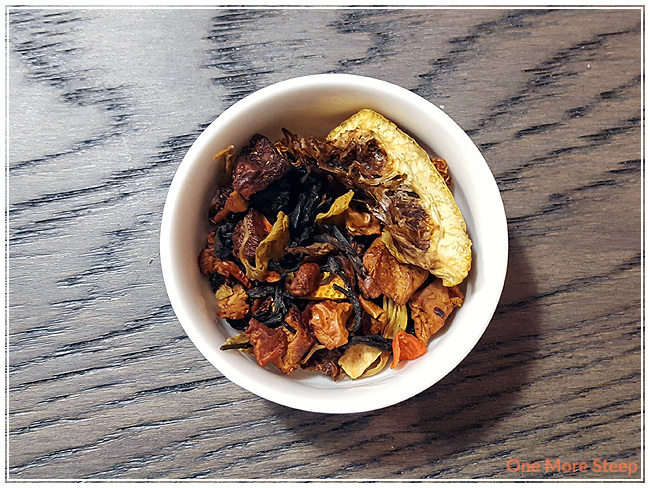 If you look at the photo of the dry leaf, it has a lot of large pieces in it – I don’t anticipate getting a lot of pots of tea out of my 50g of Lemon Cayenne Cleanse.